Scapholunate advanced collapse (SLAC) of the wrist is the most common pattern of degenerative arthritis in the wrist. The hallmark of SLAC is scaphoid or scapholunate ligament injury with collapse on the radial side of the wrist. Watson and Ballet coined the term SLAC wrist in 1984. Findings of bilateral SLAC wrist on a prehistoric skeleton from the Hassi-el-Abiod site in Malian Sahara provide paleopathologic evidence of the existence of this disease 7000 years ago. For patient education resources, see the Arthritis Center, as well as Carpal Tunnel Syndrome. The distal radius has two articular fossae for the scaphoid and the lunate. 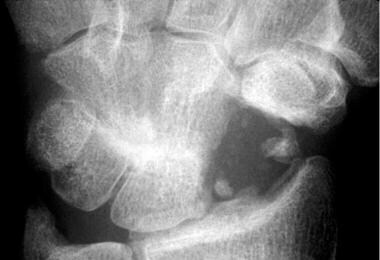 The scaphoid fossa is elliptical or ovoid and narrows toward the radial styloid in a dorsal-volar plane. Thus, the scaphoid proximal articular surface is shaped like a spoon. The lunate fossa is spherical. Injury to the scaphoid or its supportive ligaments can cause radial-side collapse with flexion of the scaphoid, thereby resulting in incongruence of the radioscaphoid joint. Narrowing of the radioscaphoid joint begins at the radial styloid aspect (stage 1A). 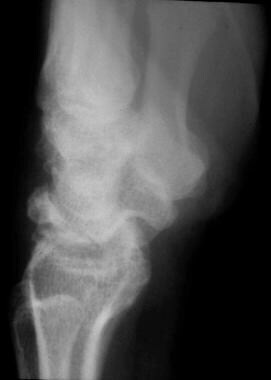 Radiographic changes appear as a sharp elongation on the radial styloid. As the disease progresses, the rest of the radioscaphoid joint is destroyed (stage 1B). In stage 1B, the entire scaphoid fossa is involved. Complete collapse of the radioscaphoid joint alters the normal load-bearing ability of the capitolunate joint. This results in a radial or dorsal radial position of the capitate. Shear stress destroys cartilage in the capitolunate joint, leading to the most advanced stage, midcarpal SLAC (stage 2). In stage 2, the capitolunate joint is additionally narrowed and sclerotic. As the arthritic pattern progresses, it shifts from the scaphoid fossa of the radius to the midcarpal capitate articulation. At all stages of SLAC wrist, the radiolunate joint is not involved, because of its spherical shape. The lunate is congruently loaded in every position and thus is highly resistant to degenerative changes. This sparing of the lunate fossa provides a basis for some of the motion-preserving procedures to treat SLAC wrist. SLAC wrist that is longstanding and goes untreated can lead to wrist pain at rest and during use, deterioration of range of motion (ROM), and decreased grip strength. The radiographic appearance of SLAC wrist does not always correlate with the symptoms. Stage 2 scapholunate advanced collapse (SLAC) wrist. Scapholunate advanced collapse (SLAC) wrist from nonunion of the scaphoid. The patient underwent 4-bone fusion. Scapholunate advanced collapse (SLAC) wrist from Kienböck disease. Initial treatment of the cause of the SLAC wrist (eg, scaphoid nonunion, scapholunate dissociation) may prevent subsequent degeneration. SLAC has been reported to be more common in men than in women and more common in persons who perform manual labor than in other individuals. It is most common in the dominant wrist. SLAC has been reported in people aged 19-82 years. The peak decade for corrective SLAC surgery is the fourth decade of life. The periscaphoid area is the site of 95% of all wrist degenerative diseases. The SLAC pattern is seen in 57% of patients with periscaphoid arthritis. Traverso et al reported the results of four-corner fusion for SLAC wrist at a minimum of 10 years' follow-up (average, 18 years; range, 11-27 years). Among the 12 patients (15 wrists) available for follow-up, the average extension-flexion arc was 68.6°, the average radial-ulnar deviation arc was 32.9°, and the average QuickDASH score was 7.8. Although 73% of the patients had radiographic changes in the radiolunate joint, functional outcome was good, patient satisfaction high, and functional impairment low. Watson HK, Ballet FL. The SLAC wrist: scapholunate advanced collapse pattern of degenerative arthritis. J Hand Surg [Am]. 1984 May. 9(3):358-65. [Medline]. Sauerbier M, Bickert B, Trankle M, et al. [Surgical treatment possibilities of advanced carpal collapse (SNAC/SLAC wrist)]. Unfallchirurg. 2000 Jul. 103(7):564-71. [Medline]. Schmitt R, Heinze A, Fellner F, et al. Imaging and staging of avascular osteonecroses at the wrist and hand. Eur J Radiol. 1997 Sep. 25(2):92-103. [Medline]. Gong X, Lu LJ. What is the implication of scaphoid ring sign in advanced Kienböck's disease? Is it a sign of advanced carpal collapse or rotary scaphoid subluxation?. J Plast Reconstr Aesthet Surg. 2006. 59(7):726-9. [Medline]. Watson HK, Ryu J. Evolution of arthritis of the wrist. Clin Orthop. 1986 Jan. (202):57-67. [Medline]. Chen C, Chandnani VP, Kang HS, et al. 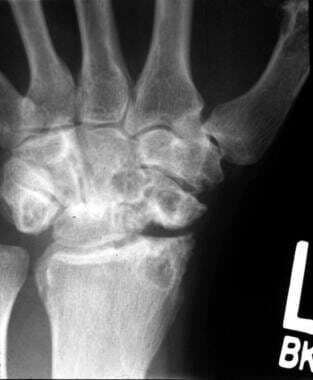 Scapholunate advanced collapse: a common wrist abnormality in calcium pyrophosphate dihydrate crystal deposition disease. Radiology. 1990 Nov. 177(2):459-61. [Medline]. Taniguchi Y, Yoshida M, Tamaki T. X-ray characteristics of wrists in calcium pyrophosphate crystal deposition disease. Is pseudogout a major cause of scapholunate advanced collapse?. J Hand Surg [Br]. 1997 Oct. 22(5):659-61. [Medline]. Traverso P, Wong A, Wollstein R, Carlson L, Ashmead D, Watson HK. Ten-Year Minimum Follow-Up of 4-Corner Fusion for SLAC and SNAC Wrist. Hand (N Y). 2017 Nov. 12 (6):568-572. [Medline]. Fassler PR, Stern PJ, Kiefhaber TR. Asymptomatic SLAC wrist: does it exist?. J Hand Surg [Am]. 1993 Jul. 18(4):682-6. [Medline]. Pilný J, Kubes J, Hoza P, Sprláková A, Hart R. [Consequennce of nontreatment scapholunate instability of the wrist]. Rozhl Chir. 2006 Dec. 85(12):637-40. [Medline]. Kadji O, Duteille F, Dautel G, Merle M. [Four bone versus capito-lunate limited carpal fusion. Report of 40 cases]. Chir Main. 2002 Jan. 21(1):5-12. [Medline]. Garcia-Lopez A, Perez-Ubeda MJ, Marco F, et al. A modified technique of four-bone fusion for advanced carpal collapse (SLAC/SNAC wrist). J Hand Surg [Br]. 2001 Aug. 26(4):352-4. [Medline]. Tielemans A, Van Innis F, Troussel S, Detrembleur C, Libouton X, Lequint T. Effect of four-corner fusion with locking plate without bone graft on functional recovery of the wrist: New treatment guidelines. Hand Surg Rehabil. 2017 Jun. 36 (3):186-191. [Medline]. Baur EM. Arthroscopic-Assisted Partial Wrist Arthrodesis. Hand Clin. 2017 Nov. 33 (4):735-753. [Medline]. Tomaino MM, Miller RJ, Cole I, Burton RI. Scapholunate advanced collapse wrist: proximal row carpectomy or limited wrist arthrodesis with scaphoid excision?. J Hand Surg [Am]. 1994 Jan. 19(1):134-42. [Medline]. Welby F, Alnot JY. [Resection of the first row of carpal bones: post-traumatic wrist and Kienbock''s disease]. Chir Main. 2003 Jun. 22(3):148-53. [Medline]. Laulan J, Marteau E, Bacle G. Wrist osteoarthritis. Orthop Traumatol Surg Res. 2015 Feb. 101 (1 Suppl):S1-9. [Medline]. Vanhove W, De Vil J, Van Seymortier P, Boone B, Verdonk R. Proximal row carpectomy versus four-corner arthrodesis as a treatment for SLAC (scapholunate advanced collapse) wrist. J Hand Surg Eur Vol. 2008 Apr. 33(2):118-25. [Medline]. Dacho AK, Baumeister S, Germann G, Sauerbier M. Comparison of proximal row carpectomy and midcarpal arthrodesis for the treatment of scaphoid nonunion advanced collapse (SNAC-wrist) and scapholunate advanced collapse (SLAC-wrist) in stage II. J Plast Reconstr Aesthet Surg. 2008 Oct. 61 (10):1210-8. [Medline]. van Riet RP, Bain GI. Three-corner wrist fusion using memory staples. Tech Hand Up Extrem Surg. 2006 Dec. 10(4):259-64. [Medline]. Sauerbier M, Kania NM, Kluge S, et al. [Initial results of treatment with the new AO wrist joint arthrodesis plate]. Handchir Mikrochir Plast Chir. 1999 Jul. 31(4):260-5. [Medline]. Kalb K, Ludwig A, Tauscher A, et al. [Treatment outcome after surgical arthrodesis]. Handchir Mikrochir Plast Chir. 1999 Jul. 31(4):253-9. [Medline]. Ekelund L, Hagberg L, Hörberg L, Jörgsholm P, Gunnarsson M. Imaging of four-corner fusion (SLAC arthrodesis) of the wrist with 64-slice computed tomography. Acta Radiol. 2007 Feb. 48(1):76-9. [Medline]. 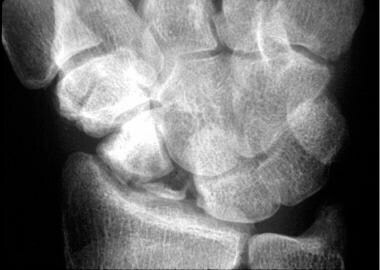 Masmejean E, Dutour O, Touam C, Oberlin C. [Bilateral SLAC (scapholunate advanced collapse) wrist: an unusual entity. Apropos of a 7000-year-old prehistoric case]. Ann Chir Main Memb Super. 1997. 16(3):207-14. [Medline]. Brown RE, Erdmann D. Complications of 50 consecutive limited wrist fusions by a single surgeon. Ann Plast Surg. 1995 Jul. 35(1):46-53. [Medline]. Krakauer JD, Bishop AT, Cooney WP. Surgical treatment of scapholunate advanced collapse. J Hand Surg [Am]. 1994 Sep. 19(5):751-9. [Medline]. Wyrick JD, Stern PJ, Kiefhaber TR. Motion-preserving procedures in the treatment of scapholunate advanced collapse wrist: proximal row carpectomy versus four-corner arthrodesis. J Hand Surg [Am]. 1995 Nov. 20(6):965-70. [Medline]. Imbriglia JE, Broudy AS, Hagberg WC, McKernan D. Proximal row carpectomy: clinical evaluation. J Hand Surg [Am]. 1990 May. 15(3):426-30. [Medline]. Mantovani G, Mathoulin C, Fukushima WY, Cho AB, Aita MA, Argintar E. Four corner arthrodesis limited to the centre using a scaphoid one piece graft and a dorsal circular plate. J Hand Surg Eur Vol. 2010 Jan. 35(1):38-42. [Medline]. Mulford JS, Ceulemans LJ, Nam D, Axelrod TS. Proximal row carpectomy vs four corner fusion for scapholunate (Slac) or scaphoid nonunion advanced collapse (Snac) wrists: a systematic review of outcomes. J Hand Surg Eur Vol. 2009 Apr. 34(2):256-63. [Medline]. Gaston RG, Greenberg JA, Baltera RM, Mih A, Hastings H. Clinical outcomes of scaphoid and triquetral excision with capitolunate arthrodesis versus scaphoid excision and four-corner arthrodesis. J Hand Surg Am. 2009 Oct. 34(8):1407-12. [Medline]. Ferreres A, Garcia-Elias M, Plaza R. Long-term results of lunocapitate arthrodesis with scaphoid excision for SLAC and SNAC wrists. J Hand Surg Eur Vol. 2009 Oct. 34(5):603-8. [Medline]. Kiefhaber TR. Management of scapholunate advanced collapse pattern of degenerative arthritis of the wrist. J Hand Surg Am. 2009 Oct. 34(8):1527-30. [Medline]. Hastings H 2nd, Weiss AP, Quenzer D, et al. Arthrodesis of the wrist for post-traumatic disorders. J Bone Joint Surg Am. 1996 Jun. 78(6):897-902. [Medline]. Weiss AC, Wiedeman G Jr, Quenzer D, et al. Upper extremity function after wrist arthrodesis. J Hand Surg [Am]. 1995 Sep. 20(5):813-7. [Medline]. Dacho A, Grundel J, Holle G, Germann G, Sauerbier M. Long-term results of midcarpal arthrodesis in the treatment of scaphoid nonunion advanced collapse (SNAC-Wrist) and scapholunate advanced collapse (SLAC-Wrist). Ann Plast Surg. 2006 Feb. 56(2):139-44. [Medline]. Noback PC, Seetharaman M, Danoff JR, Birman M, Rosenwasser MP. Arthroscopic Wrist Debridement and Radial Styloidectomy for Advanced Scapholunate Advanced Collapse Wrist: Long-Term Follow-Up. Hand (N Y). 2017 Aug 1. 1558944717725383. [Medline]. Scapholunate advanced collapse (SLAC) wrist treated with total wrist fusion. Stage 2 scapholunate advanced collapse (SLAC) wrist treated with 4-bone fusion. The authors and editors gratefully acknowledge the contributions to this topic made by Mark F. Hendrickson, MD.